While spending long hours in a conference hotel listening to colleagues, networking, catching up with friends and engaging our minds is a priority for most AAA conference attendees, we all need to make time to eat. Why not take an extra half hour and escape the artificial lights and din of the conference to see some of the city and get a tasty lunch that will cost half as much as hotel food. Hop on BART and get off at the 24th Street Mission stop. San Francisco is all about neighborhoods. The Mission was traditionally a working-class Latino neighborhood but it has undergone some major transformations over the past twenty years. You can taste them for yourself. On Mission Street, just a stone’s throw from the BART station, is La Taqueria. Although the number one taco shop is greatly contested in San Francisco, this little restaurant generally comes out in the top five. The Mission is also famous for its burritos, mainly for their ridiculous size. It is nearly unthinkable, but if you are not up for Mexican food, check out Rosamunde Sausage across the street for delicious sausages and beer. Wander down 24th Street for more Latin American culinary delights at La Palma. You can watch the women in the kitchen making tortillas, and get some great takeaway food. Around the corner on Harrison Street you can indulge in a SF ice cream experience at Humphry Slocombe. Don’t miss the “secret breakfast” flavor. Too cold for ice cream? Hipster donuts and coffee are just down the street at Dynamo donuts. 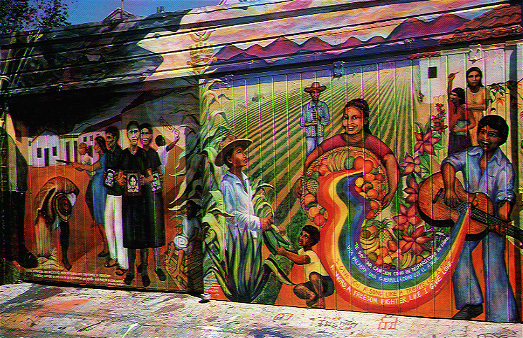 As you stroll through the neighborhood after lunch, take note of the many murals that adorn sides of buildings and wooden fences in this area. They tell the story of Latino migrants and their heritage.